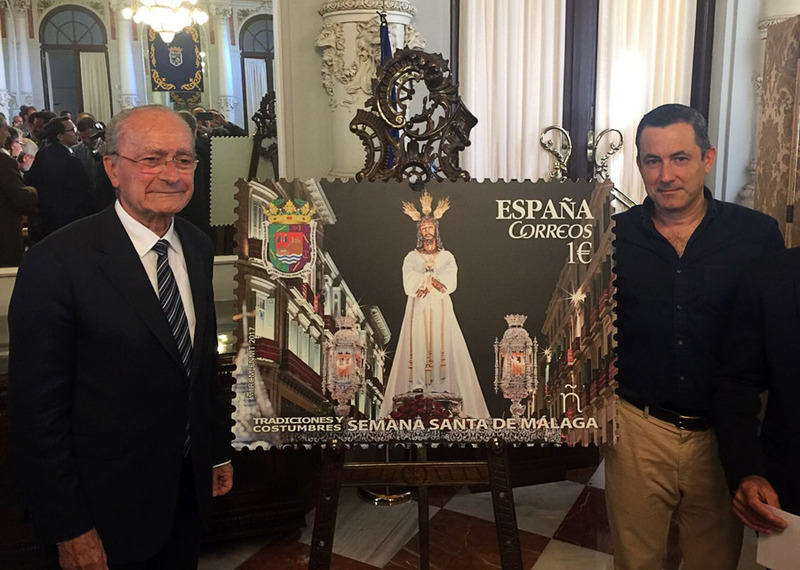 I was invited by the Department of Tourism of the City of Malaga to the presentation at the City Hall of a new stamp of Post about the Holy Week in Malaga. The only time before that a stamp had been made on the Holy Week in Malaga was 29 years ago. The new seal reproduces a photograph of JesÃºs Cautivo as it passes through MarquÃ©s de Larios street in the capital on Holy Monday. The presentation was made by the mayor of Malaga, D. Francisco de la Torre in the Hall of the Mirrors. This photograph of JesÃºs Cautivo is part of a report I made two years ago for the Tourism Area. It still makes this very original diffusion of a photograph of me more endearing to me the fact that on the right side there is the building of calle Larios number 4, where I lived my first five years in Malaga. Among all the photographs of Holy Week in Malaga that I have done, this is one of the ones I like the most because of the cleanliness, symmetry and contrast of the black and white of Jesus' tunic and the early morning sky.